Have you heard about SAT Subject Tests? They’re not talked about much in college planning conversations, but they’re an important part of a good application. Unfortunately, you may be one of the many high school students, who don’t know about them or find out too late. answer some commonly asked questions. SAT Subject Tests assess what you know in one subject. There are SAT Subjects Tests in Biology, U.S. History, Math, Spanish, and several more subjects. There are 20 tests in all. Unlike Advanced Placement (AP) tests, which evaluate college-level material, SAT Subject Tests cover material from your high school courses. However, they’re still challenging. They include a whole year’s worth of material, and you’ll probably need to study for a good score. Over 500 colleges use the results from SAT Subject Tests. 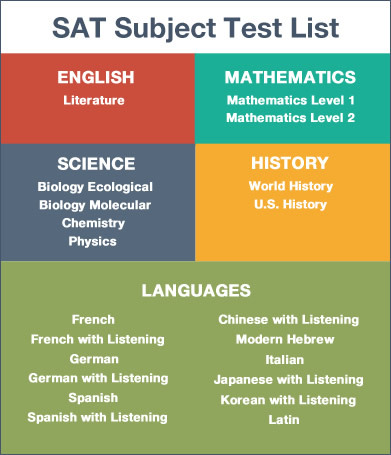 “Require” – The more selective colleges and most Ivies “require” SAT Subject Tests with your application. Some want specific tests, usually English and Math, while others let you choose. “Recommend” – Other colleges will “recommend” you send them scores. Anytime a college “recommends” you do something, I suggest you do it. I guarantee that most of the other applicants will send scores. Not submitting scores will make you stand out, not in a good way. Your other application credentials must be substantially better to overcome the missing scores. Don’t send in your scores if they were a total disaster. It’s better to try to get the best scores possible, so you can comply with their recommendation. 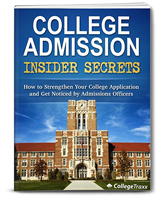 “Consider” – There’s less pressure on you to send scores to colleges that “consider” them. However, the fact they will “consider” SAT Subject Test scores means they’re interested. If your scores are good, there’s an advantage to including them, because many other applicants will not make the effort. If your scores aren’t good, it’s not in your best interest to include them. It may work against you. No mention – Some colleges don’t reference SAT Subject Tests in their application information. However, this doesn’t mean they aren’t interested. If you have good scores, send them. They will definitely help your chances. Simply, colleges like them. Here’s why. Everyone takes the same test – Colleges can compare your score to the scores of other applicants. They love that. It’s hard to compare applicant grades, because high schools are all different, so standardized tests, like Subject Tests, give them that option. Historical Data – The test has been around for many years. Colleges can use scores from previous students to predict how well you’ll do at their school in that subject. To learn your future major – College know students choose what Subject Test they take, based on their interests. Your choice of SAT Subject Test gives them insight into your interests. Since colleges are interested in scores, here’s how that can help you. Score advantage – Scores that are higher than other applicants’ will put you at an advantage. Demonstrates consistency – If you stated in your application you were interested in pursuing chemistry, taking the Chemistry SAT Subject Test shows consistency in your intention. Colleges love consistency. It communicates stability and focus. Level of knowledge – Your score tells colleges what your level of knowledge is in that subject and how well you can use that information to solve problems. Both factors are important to demonstrate on a college application. You may have noticed a consistent factor. The better your score, the more it will help you. Fortunately, unlike the SAT, you can study for SAT Subjects Tests. This gives you some control over how much your SAT Subject Test score can affect your admission chances. The more you study, the better your score, the more it can help you. SAT Subject Scores can range from 200 to 800. If you want to know how well you did, the College Board publishes percentile ranks for all of its SAT Subject Tests. To find them for any year, enter the following phrase into a search engine, like Google: “sat subject test percentile ranks 2016.” Be sure to substitute the year you’re interested in. Some colleges accept ACT scores in place of Subject Test scores, because the ACT covers the core curriculum areas: English, math, reading (which covers social studies and literature), and science. SAT Subject Tests test the same subjects, so those colleges are comfortable letting you choose. Send in whichever scores put your academic abilities in the best light. Here’s a strategy that may only interest a few people, but I’ll tell you anyway. You can use Subject Tests to demonstrate your motivation, discipline, and learning ability and potentially place yourself well above other applicants. You need not take a course in high school before you take the SAT Subject Test. Two students I knew borrowed a textbook, bought a couple of prep books, learned the subject on their own, and then took the SAT Subject Test. Both earned respectable scores. You can do the same thing if you have the time and want to put in the work. Explain what you did in your application and send in the resulting score to prove it. That demonstrates you are capable, motivated, and disciplined enough to learn independently, characteristics colleges absolutely love to see in applicants. It’s also a great way to showcase some original thinking. As I mentioned before, an SAT Subject Test tests your knowledge of one subject. Because they cover specific content and information, you can study for them. You can even find out what’s on the test by looking on the College Board website or using a prep book. The SAT assesses how well you think. It tests your abilities and skills in comprehension, logic, and analysis, and your exposure to knowledge. It’s difficult to know what will be on the test and to study for it. The most effective way to study involves practicing the question format and learning answer strategies. When should I take an SAT Subject Test? The best time to take an SAT Subject Test is immediately after finishing the same subject course in high school. If you took Biology during your sophomore year, the best time to take the Biology Subject Test would be at the end of your sophomore year. Can I choose which SAT Subject Test I want to take? On the day of the test, you’ll get a test booklet that includes all the SAT Subject Tests given that day. You can add a test or take a different test than the one(s) you originally signed up for. You’re only graded on the tests you take. The only test you can’t take, unless you register for it, is a Language with Listening Test. That test requires special recording equipment that must be set up ahead of time. Can I choose which SAT Subject Test scores I send to colleges? Some colleges allow you use Score ChoiceTM. If you’re not familiar with it, Score ChoiceTM lets you select the scores you want to send to colleges. You can find out how to do it on the College Board’s website. If you can find no requirement to send all your scores, assume you can use Score ChoiceTM. But look carefully before coming to that conclusion. Is there any other reason to take an SAT Subject Test? Colleges use them in a couple of other ways. Some colleges will give you credit for courses if you receive a high enough score on the corresponding SAT Subject Test. I’ll warn you, though; the credit is usually for lower level introductory courses, and most competitive colleges don’t offer the option. It can, however, be helpful in certain situations, so if you’re interested, check a college’s website to see if they offer the option. It’s more common for a college to use SAT Subject Tests to place you in particular courses or to skip a course level entirely. This gives you the opportunity to take more advanced (and usually more interesting) courses earlier in your college career. Each test is one hour. There is a break in between each test if you take more than one. What types of questions are on them? All tests have multiple-choice questions. The Language for Listening test also has multiple-choice questions, but requires that you listen to the questions in the language you’re being tested on. SAT Subject Tests scores range from 200 to 800. You can register for SAT Subject Tests on the College Board website. How Many Subject Tests can I Take? You can take up to three tests on one test date. Subject Tests are given on the same day as the SAT, except for the March testing date. Not all tests are offered on every test date, but most are. Language with Listening Tests are only offered in November. You can find a calendar on the College Board website with the test dates and tests given. Can I take the SAT and SAT Subject Tests on the same day? How much does a SAT Subject Test cost? As of the date of this post, the registration fee for SAT Subject Test is $26, and each additional test costs $18. Language Tests with Listening are $26. Fee waivers are available if you have financial concerns. If you’re unsure of how the process works, talk to your guidance counselor. SAT Subject Test scores are a great way to communicate to colleges how well you have mastered the material in a particular subject. They can be included with your college application to add evidence of your academic abilities, emphasize your interest in a major or career area, and increase your chances for admission.